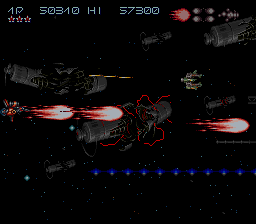 Original space shoot-em-up with Mode 7 graphics. 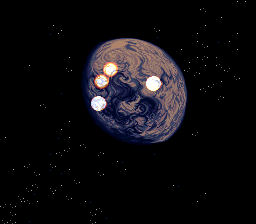 Armada of Annihilation has attacked the planet Illis. All the ships in the fleet have been destroyed... except one: the D-117B Axelay Strata fighter. One lone pilot climbs aboard to single handily take on the Armada and their dreaded leader, Veinon, with the fate of Illis at stake! Well what can I say about this game? One word, REMARKABLE!! 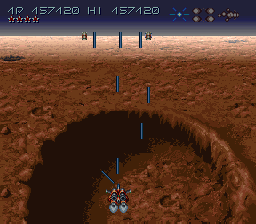 In my opinion Axelay is still one of the most advance 2D shoot em-up's ever created. 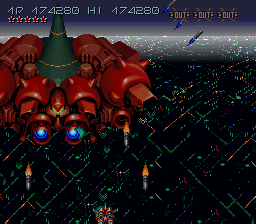 I thought "Last Resort" on the Neo Geo looked amazing, that is until Axelay was released. 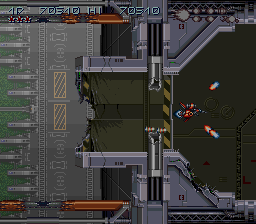 Konami know how create a game that is aesthetically pleasing, Axelay epitomizes how a 2D shoot-em-up should look like. 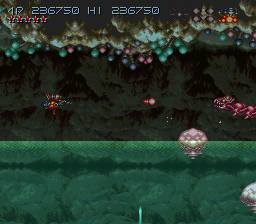 The game is very reminiscent of "Salamander" on the Famicom using the side/top scroll view adding to variation for game play. You pilot you way through various vertical/horizontal scrolling levels avoiding hazards and destroying anything that appears in your flight path. 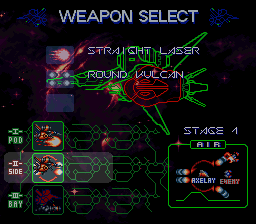 You have a choice of 3 different types of weapons and upon completion of each level you receive an extra weapon. One factor that I like in terms of the craft is when you get hit you loose the current weapon and you are forced to use the remaining weapons. I feel this adds a bit of realism to the gaming experience. 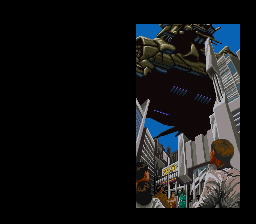 The graphics are excellent, sometimes I think I am playing on my Neo Geo. 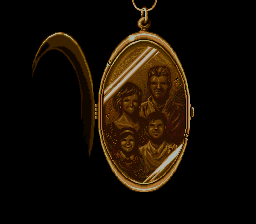 It's unbelievable how Konami managed to create a game of this nature on the Super Famicom. 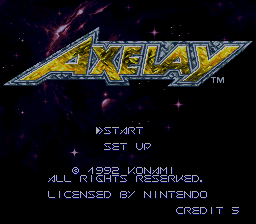 Axelay is visually impressive, the back drops are fantastic, the sprites and animation are excellent. 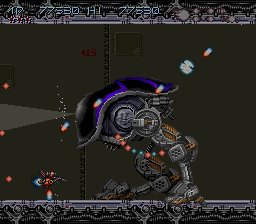 The end of level bosses are a pleasure to battle, especially the "Ed 209" looking boss on level 2, a fantastic sprite with great animation (you can see the shells "Mode 7" is used in full effect and the Parallax scrolling is superb. 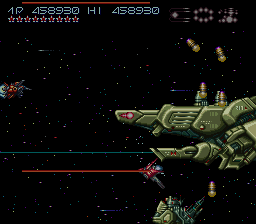 Konami have really pushed the power of the Super Famicom to its limits, there is so much detail in this game its unreal!! The sound and music are both excellent and very atmospheric, Konami really know how to amalgamate all the elements to make the gaming experience enjoyable. There are 6 levels in the game and you can choose from 3 difficulty settings. 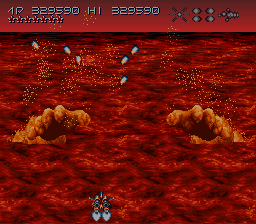 The levels change perspective on each stage which adds variation to game play. Unfortunately I find the levels some what short but expect some great battles. I like the way the difficulty increases when you progress through the levels, level 6 is tough, especially on difficult mode. Availability Some say Axelay is a rare title but I always see it available on Ebay. The game is too over priced though-seriously! At the moment a (MIB) sells for roughly £40, £26 (CIB) and a loose cart for £7. I recommend bidding on one than opt for the “Buy it Now” price. I would not pay more than £22 for (MIB). Glitches Considering how advanced Axelay is there is little slow down, mostly on level 5 with the dragons. Axelay is aesthetically pleasing but unfortunately lacks real depth in terms of consistent game play. 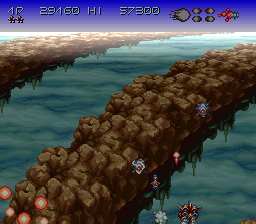 The overhead scrolling levels I find more challenging than the side scrolling levels. 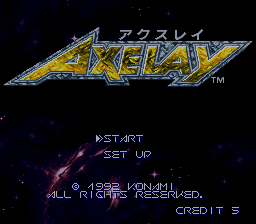 Axelay could have been the Ultimate 2D shoot-em-up if only Konami put more effort into the game play. 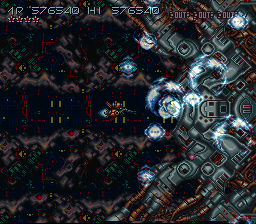 I still consider Area 88 to be the best all round 2D shooter but Axelay's graphics and style is what gives its appeal and I have to say it works. 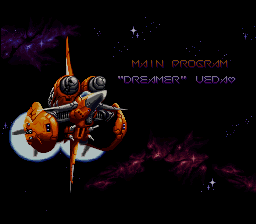 I do consider it to be a classic in the line of 2D Shoot-em-ups for the Super Famicom. 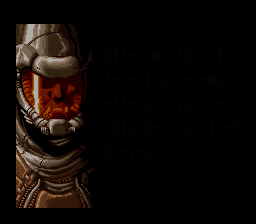 So if you like your R-Type, Area 88, Gradius III, Super Aleste and Darius Twin then you should own a copy of Axelay to add to your collection.